Exploring the metaphor of deconstructing and reconstructing in relation to memory, identity and perception, FSU Art faculty member Chalet Comellas’ installation, Working Memory, populates the gallery space with quilt-like constructions of fabric, ephemera, and paintings embedded with sound. Memory quilts have been constructed since the Victorian era to honor and record the lives of relatives and friends. Drawing upon this concept the viewer has the ability to shift and change the installation, thereby constructing new narratives from the existing information. This solo exhibition is hosted in the Geoffrey A. Wolpert Gallery at the Arrowmont School of Arts and Crafts in Gatlinburg, Tennessee. 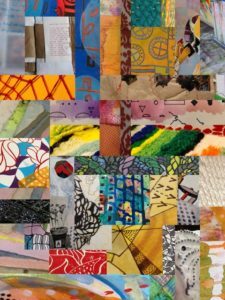 The school has a rich history rooted in traditional craft and this exhibition is an exciting opportunity to present a contemporary application of these mediums. Her show will coincide with, “Touch: Interactive Craft,” a national juried exhibition taking place in the adjacent Sandra J. Blain Gallery. The exhibit opens February 5, 2016 with a closing reception on Friday, March 11, 6:00-8:00 pm. Comellas will be giving an artist talk in the gallery at 7 pm.